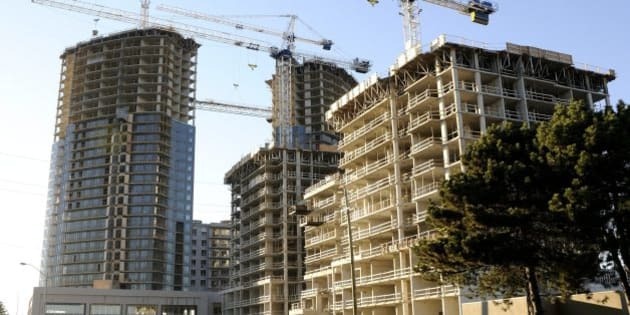 TORONTO - Sales of new Toronto-area high-rise homes dropped to a 10-year low in August, the Building Industry and Land Development Association said Monday. The group says 633 new high-rise homes were sold in the Greater Toronto Area last month, 46 per cent below the long-term average. The low-rise market showed some strength when compared to 2012, with 777 sales of new detached, semi-detached and townhomes during the month of August. But that was still the third-lowest level in 10 years and 43 per cent below the long-term average, BILD said, citing statistics compiled for it by RealNet Canada Inc. The price index in the low-rise sector reached a new record high of $658,938, while the prices of high-rise homes remained steady. As a result, the price gap between the GTA's high-rise and low-rise sectors has grown to the highest on record at $222,149. "Constrained land supply has severely diminished inventory in the low-rise sector, bringing prices to a considerable increase," said association president Bryan Tuckey. "Another factor is the rising government fees and charges which, on average, add up to one-fifth of the cost of a new home."